Couch was a three-time National Champion and top contender in National Tournaments from 1935 to 1949. He was considered the “stylist” of platform tennis. (Fox Meadow Tennis Club). Born an only child in Peekskill, NY, in 1901, his father was the president of a local county bank and his mother was an exceptional cook. He graduated from Peekskill High School and Dartmouth College in 1923 where, among other things, he served as manager of the football team, played on the tennis team, and was voted “most likely to succeed” by his classmates. Kip married Helen Hendrickson from Vassar (class of 1924), in 1926, and they went on to live in Scarsdale for most of their married life. 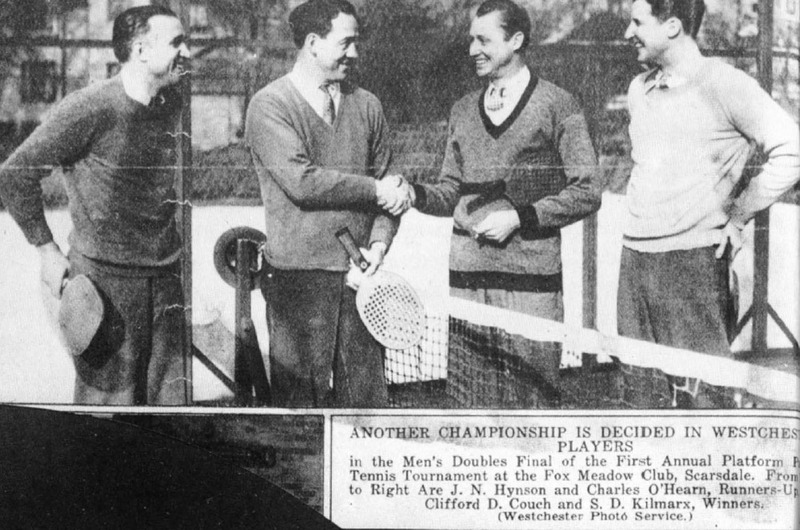 Fox Meadow Tennis Club became Couch’s second home, where he was very active in the platform tennis program starting from the early days when the first court was built in 1931. There were many freezing Saturday afternoons when he helped shovel the snow off the courts before playing six sets of paddle, often with Charley O’Hearn. Afterwards he would join his family in front of the fire at the Fox Meadow Club for hot chocolate served by the elder ladies of the club. 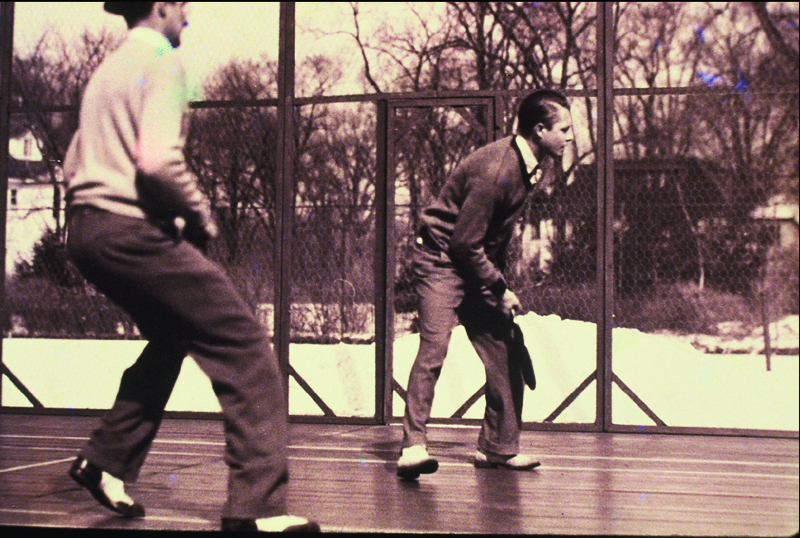 Among the best of the players in the early APTA championships, Kip Couch was once called, by George Trevor of the Sun, “the stylist of the paddle tennis realm with effortless stokes as fluent as Tilden’s.” Couch’s hard, fast-dropping forehand was very difficult to successfully volley. He was a winner in two men’s doubles championships, first with partner and previous Dartmouth tennis teammate Summer D. Kilmarx, over James N. Hynson and Charles M. O’Hearn in 1935 and 1939, and, later with former opponent O’Hearn over Rawle Deland and John R. Moses in 1948. Couch and his wife, Helen, were also finalists in the first Mixed Nationals in 1935. Kip Couch’s love of the game was handed down through the generations and this helped grow interest in paddle regionally. His daughter, Prill Couch Meyer, grew up learning both tennis and paddle at Fox Meadow under the patient eye of her father. She went on to teach paddle in Greenwich, CT, for ten years at the Village Recreation Department in Greenwich She and her three children would rather play paddle than any other sport. Couch’s granddaughter, Hendy Meyer Dayton, currently serves on the Board of APTA as Region VI President, and promotes the game on the West Coast. Grandsons Kip Meyer and Christian Meyer and their families are very active players in Fairfield County, CT, and Concord, MA, respectively. After graduating from Dartmouth in 1923, Kip worked with the Hofstatter & Co. in New York City until 1940, when he joined Celanese Corporation in Washington, DC, as a sales manager. After World War II, he had a stint at Atlas Powder and then became the VP for sales at Pantasote Company.